Andrew Puzder, President Trump&apos;s pick for labor secretary, withdrew his nomination Wedneday. WASHINGTON — In many ways, the nation’s capital on Wednesday appeared utterly normal: a visit from a head of state at the White House, senators popping into hearing rooms to fire off a few questions, and lobbyists heading to lunches of steaks and crab cakes. But underneath it all is a capital in chaos. In the nearly four dramatic weeks since President Trump was inaugurated — with a pledge from the podium that “now arrives the hour of action” — his administration has reached a moment of crisis. Michael Flynn, his national security adviser, was forced to resign Monday, earlier in his tenure than anyone who has ever held that position. 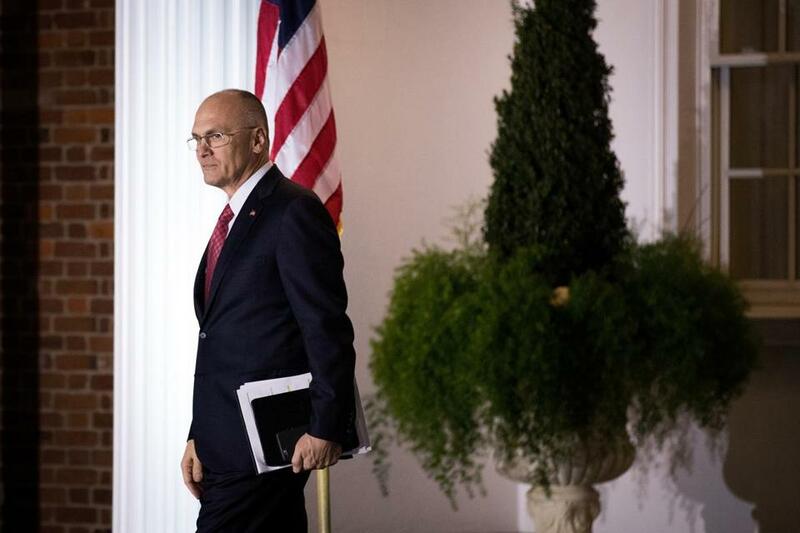 About 36 hours later, his labor secretary nominee, Andrew Puzder, withdrew under a groundswell of bipartisan opposition, becoming the 12th Cabinet nominee in history to withdraw without a vote, and the first since 2009. Congressional Republicans are preparing to launch investigations into Russia’s involvement in the 2016 presidential campaign, including reports that Trump campaign officials were in frequent communication with Russian intelligence officials. Trump often publicly contradicts what his press secretary says, and various factions within the White House are warring with one another. During a press conference on Wednesday, Trump amplified what he had written on Twitter earlier in the morning, lashing out at leakers in the intelligence community and the media and blaming them for Flynn’s wounds — even though the wounds appeared to be self-inflicted, both by Flynn and the White House. Trump entered the White House as the first president without government or military experience, and with a steep learning curve. But even for a newcomer, the first few weeks have featured a startling display of incompetence for a team occupying the pinnacle of power. “Every administration faces turbulence. This is perhaps more turbulent than we’ve been accustomed to in the past,” Senator Marco Rubio told reporters Wednesday, before heading to dinner at the White House. On Monday afternoon, senior adviser Kellyanne Conway said that Flynn had “the full confidence of the president.” A few hours later, Flynn was forced to resign. On Tuesday, White House press secretary Sean Spicer several times emphasized that “the erosion of trust was, frankly, the issue” behind Flynn’s departure. “I speak for the president,” Spicer noted. By Wednesday, the president himself was singing a completely different tune. Gone was the presidential mistrust. In its place, high praise. The president said he stood by the man he had just asked to stand down. Trump won the election on a message to blow up the norms of Washington. It was a refreshing approach to many in America who had grown tired and distrustful of the status quo in a city filled with people who profited from established ways of doing things. So far, he has governed in the way that he campaigned. He peddles falsehoods (something he has called “truthful hyperbole,” which he defines as “an innocent form of exaggeration — and a very effective form of promotion”) and seems to relish the idea that his supporters take him seriously, but not literally. He operates in a haze of contradictions, seemingly as a way of confusing his true intentions. And the longtime television producer allows open conflicts and warring among his own advisers. But he is now discovering that a successful campaign is different from successful governance. Using truthful hyperbole doesn’t work with a legal system that takes him literally. And the confusion he sows, interpreted in the most favorable light as part of a strategy, is actually angering those in Congress who have been blindsided by some policies, and troubled by others. Some top Republicans are growing more vocal about their differences with their party’s standard-bearer. Trump has kept up a blizzard pace, providing as much news in three weeks as most presidents do in 100 days and delivering on a goal of having a “shock and awe” agenda. He has named a Supreme Court nominee, officially gotten out of the Trans-Pacific Partnership trade deal, and signed a number of executive orders. But he has also unleashed a series of disputed claims, from his debunked theory that Massachusetts voters by the busloads illegally cast ballots in New Hampshire to his refuted boasts about the size of his crowd during the inauguration. He has publicly criticized Nordstrom for dropping his daughter’s line of clothing, which led Conway to promote the products from the White House briefing room — which then triggered bipartisan calls for an investigation and disciplinary action. The Office of Government Ethics said this week that the White House should consider disciplining Conway. What is lacking is a plan to meet his campaign promise to repeal Barack Obama’s health care law and replace it with something else. Nor has he delivered his promised tax reform plan, or a firm proposal to build a wall along the Mexican border. His most high-profile executive order — banning immigrants from seven Muslim majority countries — has caused disruption at airports around the world, prompted protests and lawsuits, and has been thwarted, at least temporarily, by the courts. Questions remain over Russian involvement in the 2016 election, and reports that Trump’s campaign was in constant contact with Russian officials. Trump ignored repeated questions about those ties on Wednesday, but Republicans are vowing to investigate. Trump has taken to calling on conservative media outlets at his press conferences, hoping to get friendly questions. Trump, meanwhile, is returning to campaign mode. He’s planning to hold a rally Saturday at an airport hanger in Melbourne, Fla., the first such event since he was sworn in and a reminder of 2016 successes that have been elusive in 2017. Annie Linskey of the Globe staff contributed to this report. Matt Viser can be reached at matt.viser@globe.com.